This is my Halloween costume this year. 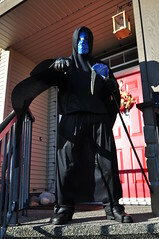 I made the mask to go with my grim reaper robe so that I could be the Blue Screen of Death. I also made an "Any" button prop that I could dare people to press :0) Of course, after I finished making the costume Thursday morning, I got an email from admin that we wouldn't be allowed to wear masks at work. Bummer.